The creators of the card game that broke Kickstarter records celebrate by sponsoring pizza parties at animal shelters all across North America. February 23, 2015, 12:14 p.m.
With 219,832 backers and a record $8.78 million raised over 30 days, the Exploding Kittens card game is the most-backed Kickstarter project ever — and the game's creators are sharing the wealth. The game, which features catnip sandwich cards and unicorn enchilada cards in addition to the exploding kittens, is the creation of Elan Lee, Shane Small and Oatmeal comic artist Matthew Inman. It's described as a "highly strategic kitty-powered version of Russian Roulette." Draw an exploding kitten, and you're out of the game — unless you can defuse the flaming feline with a laser pointer, kitten therapy or a variety of other unique cards. "When we were playing the original version of the game, instead of a kitten there was a bomb card, so the whole time we played, everyone was stressing and worrying about 'the bomb,' Inman said last week during a Reddit AMA (ask me anything). "I thought it'd be funnier to make the bomb a kitten instead — that way you wind up with a room full of people all living in fear of a kitten." The creators' goal was to raise $10,000, and they met that goal in just two hours. By the end of the campaign's first day, $2 million had been raised. “Once we hit our funding goal, the campaign was no longer about money, it was about a community," Lee said during the AMA. So the creators got even more involved with their community, creating comic illustrations of their backers and reaching out to cat shelters, asking workers to tweet photos of themselves holding signs with the hashtag #RSVPizza. Every shelter that posted a photo received a pizza party on Feb. 18 to "honor the superheroes in our lives who care for hurt and homeless animals." By the end of the day, the game makers had sent more than 1,000 slices of pizza to shelters across North America. That same day, they emailed their campaign backers to share the cheesy, greasy news, and they encouraged them to get involved with their local animal shelters. "Sign up to volunteer, donate toys or kitten and puppy food, and get to know the fine folks who are making sure that animals in your neighborhood find loving homes," the email reads. And it seems the game makers' shelter outreach isn't over yet. 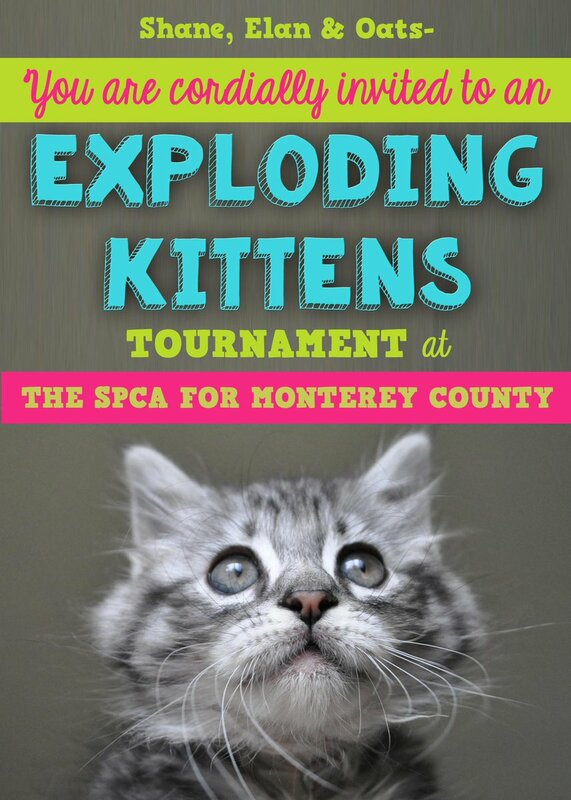 During the AMA, a representative from SCPA for Monterrey County asked if the creators would attend their Exploding Kittens tournament when the card game is released in July. "Invite us," Lee said. "If we're around, we'll be there." The creators of the card game that broke Kickstarter records celebrated by sponsoring pizza parties at shelters across North America.